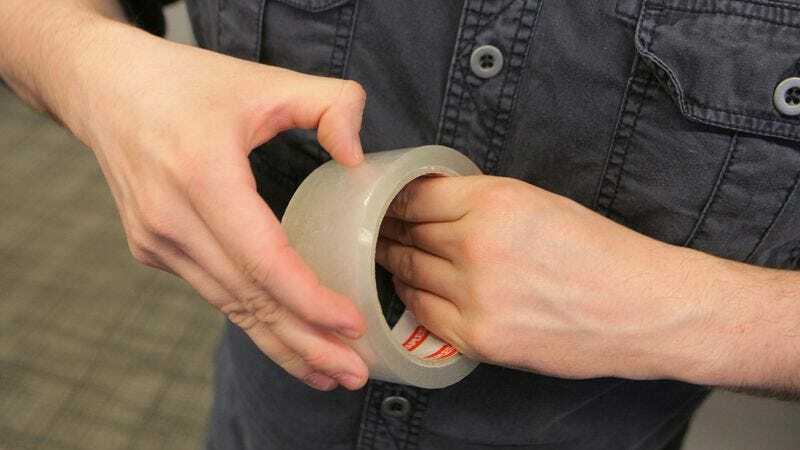 BLOOMINGTON, IN—A new study published Friday by researchers at Indiana University revealed that U.S. citizens waste approximately 2 million hours annually trying to figure out where a roll of tape starts. “According to our data, thousands of hours are squandered each day by Americans running their fingers along the outside of a roll of tape until they stumble upon the frayed edge where the tape begins,” said the study’s co-author Bethany Cohen, who noted that the amount of time Americans fritter away bringing the roll of tape up close to their face and slowly tracing their fingertips around its perimeter accounts for nearly $15 billion annually in lost productivity. “Furthermore, we discovered that when Americans eventually find where the tape starts, they waste an additional 4 million hours per year meticulously picking at the tape with a fingernail until they have a large enough tab to peel back the adhesive material.” The study also found that $700 million worth of tape is lost annually when a useless, narrow part of the piece sticks to the roll and accumulates around the edge.